Update: 5th May 2012, Sa. Assalamualaikum. 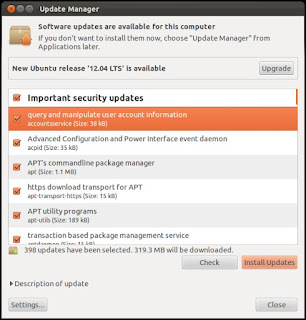 Last Friday (27th April 2012M), i tried to upgrade my laptop from Ubuntu 11.10 Oneiric Ocelot to Ubuntu 12.04 Precise Pangolin. Somewhere in the upgrade process, the system froze. Ctrl+Alt+Del didn't work. Alt+F2 didn't work. The only thing that worked was a force shutdown. Affects of that action showed after the login screen (at the next and succeeding startups); a black screen and cursor. No menus, no Panel. Just a black screen and a cursor. My husband on the other hand had just formatted his laptop, switching from Windows to Ubuntu. He was much luckier in the upgrade than me. He managed to upgrade his laptop to Ubuntu 12.04 albeit with much difficulty which was probably caused by Nvidia graphics driver. Graphics on his laptop is a gamer's repellent; the resolution is low. Update: 5th May 2012, Sa. He has solved his graphics driver problem by installing a beta driver obtained from Nvidia's website. 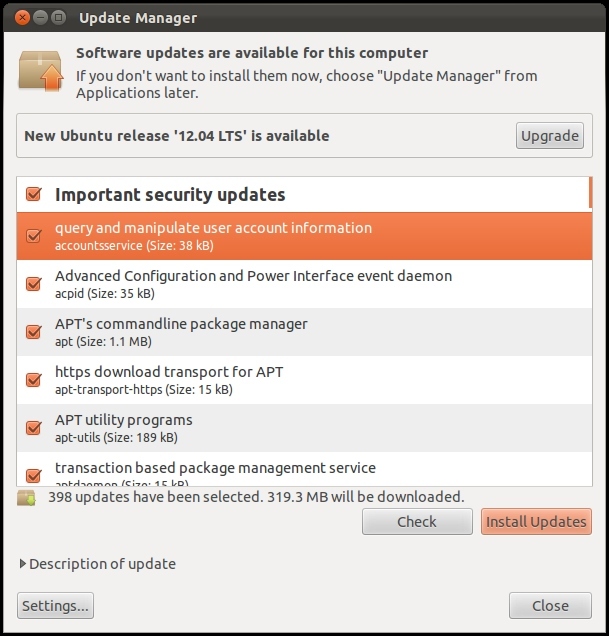 Seeing that Ubuntu 12.04 has problems with Nvidia, he suggested me to downgrade from 12.04 to 11.10. Both our machines run Nvidia graphic cards by the way. Before the downgrade, to be safe, i made copies of my work; my husband rebooted using the Ubuntu 11.10 Live CD to access the system. The problem is i can't find my files in the Documents folder, Downloads folder, Music folder, Pictures folder, and Videos folder, also files on the Desktop. i've been searching in folders but couldn't find the contents of those folders. My husband says the files are there somewhere but doesn't know the location. So, what's the directory to those folders? Or are the files in those folders gone? ... which means about 6 months worth of screenshots and downloaded files are gone for good. Luckily way before the upgrade i had run monthly backups, from browser bookmarks to browser settings to files on the Desktop to fonts in the system. The only thing to do is a restore. My latest backup was on 26th April. Thus anything between the last backup and recent upgrade/downgrade are gone. Of all the things, the only folder i didn't backup was the Downloads folder :'-( and of course the Trash folder. Now am back to Ubuntu 11.10. As seen in Pic 1, there are 398 updates. Programs such as Kile, GIMP, etc need to be re-installed. The upgrade/downgrade coupled with slow Internet connection, it's almost 4 days of downtime... and increasing. Pic 1 - i kid you not... 398 updates!